For those who keep asking why there should be an international intervention in Libya but not in Syria, here is one answer: Russia and China have blocked an attempt to have the United Nations Security Council from making any statement at all about the political repression in Syria, which has left an estimated 350-450 persons dead, most of them protesters rather than police or troops. Moreover, Lebanon also opposed having a statement made, and no Arab country approached the UNSC to do something about Syria. Russia argued that the situation in Syria is purely domestic and does not threaten international order. France did lead a charge to get the UNSC to take a strong stand against the use of military means to repress dissent in Syria, but it was blocked. I don’t see how this disparity in the treatment of the two countries can be laid at the feet of “Western hypcrisy.” Surely if anything it is “Eurasian hypocrisy,” insofar as Russia and China declined to stop the condemnation of Libya or the call for a no-fly zone, but they have stopped so much as a slap on the wrist for Syria. Of course, as bad as the situation in Syria is, it isn’t so far comparable to Libya, where the loss of life is in the thousands, not hundreds, and 30 tanks were lined up to fire on non-combatant crowds demonstrating in downtown Zawiya and Misrata. The Baath regime’s crackdown in Deraa has in any case provoked the resignations of 200 members of the ruling Baath Party, most of them living in or near Deraa. Resigning from the authoritarian ruling party in protest was unheard of until this week. 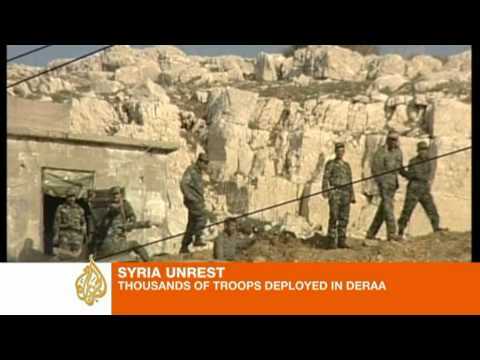 This Aljazeera English report says that soldiers, armor and snipers are now everywhere in the southern city of Deraa, which has been invaded. There have also been defections from the officer corps to the dissenters, as in Deraa.